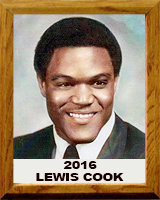 Lewis Cook played football for 4 years for Tucson High School. He was a varsity starter for 2 years for both offense and defense. During his senior year, he was 1st team All City (captain), 1st team All State (Arizona Daily Star, Tucson Citizen, Arizona Republic) (Captain). He was also 2nd team All American, leading rusher in the state and Player of the Year. He was Co-Captain of the 1965 State Championship Football Team and was chosen as one of the top ten football players in the 100 year history of Tucson High School in 2015 by the Arizona Daily Star. In Basketball he was a starter for 3 years. He also played baseball as a sophomore at Tucson High. He was chosen by the San Francisco Giants to be honored on the field for hitting 2 grand slams in one inning—a feat that had never been accomplished (Hi Corbett Field). At this event he met the great Willie Mays. He was offered a professional contract by the New York Mets as a fifteen year old and would continue to be pursued even into college. For football, Cook was highly recruited out of high school by major colleges all over the country, signing with Arizona State. He also attended Arizona Western College and Idaho State University, setting both offensive and defensive records.